I'd like to change the color of the placeholder text I set in my UITextField controls, to make it black. I'd prefer to do this without using normal text as the placeholder and having to override all the methods to imitate the behaviour of a placeholder. then I should be able to do this. But I'm unsure how to access the actual placeholder object from within this method. // TODO: Add fall-back code to set placeholder color. Easy and pain-free, could be an easy alternative for some. Not suggested for production, Apple may reject your submission. You can Change the Placeholder textcolor to any color which you want by using the below code. This is not working on iOS 7 anymore, according to Martin Alléus. Tested in iOS 8.2 and iOS 8.3 beta 4. In order to change placeholder color in storyboard, create an extension with next code. (feel free to update this code, if you think, it can be clearer and safer). I had already faced this issue. In my case below code is correct. Hope, this may help you. Note: Apple may reject (0.01% chances) your app as we are accessing private API. I am using this in all my projects since two years, but Apple didn't ask for this. Swift version. Probably it would help someone. Categories FTW. Could be optimized to check for effective color change. 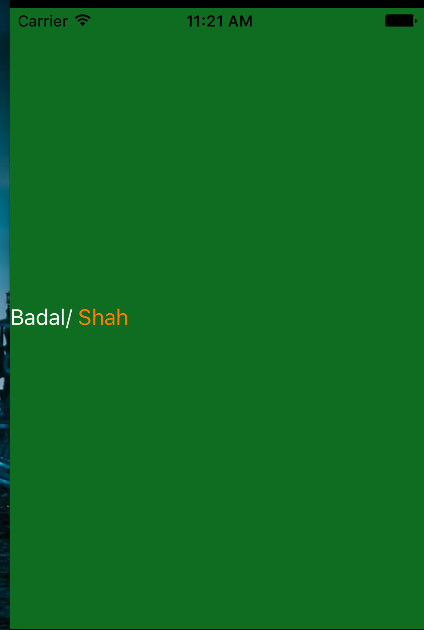 To handle both vertical and horizontal alignment as well as color of placeholder in iOS7. drawInRect and drawAtPoint no longer use current context fillColor. iOS 6 and later offers attributedPlaceholder on UITextField. iOS 3.2 and later offers setAttributes:range: on NSMutableAttributedString. Overriding drawPlaceholderInRect: would be the correct way, but it does not work due to a bug in the API (or the documentation). The method never gets called on an UITextField. You might use digdog's solution. As I am not sure if that gets past Apples review, I chose a different solution: Overlay the text field with my own label which imitates the placeholder behaviour. // Need to add it to the superview, as otherwise we cannot overlay the buildin text label. Iam new to xcode and i found a way around to the same effect. I needed to keep the placeholder alignment so adam's answer was not enough for me. [mutable addAttribute: NSForegroundColorAttributeName value:[UIColor orangeColor] range:[_txtServiceText.placeholder rangeOfString:@"Shah"]]; // Replace it with your secondcolor string. Not the answer you're looking for? Browse other questions tagged ios uitextfield or ask your own question. 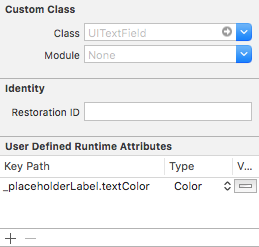 How to set the color of the place holder text for a UITextField while preserving its existing properties? How to change placeholder text color in xib?